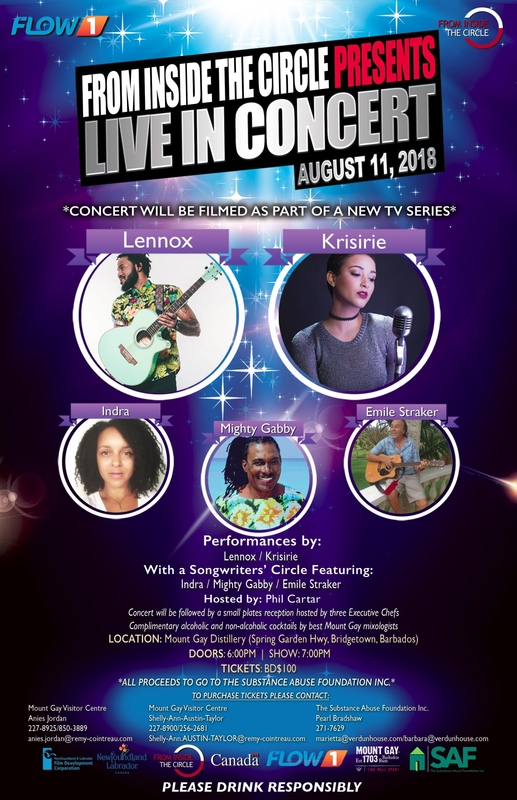 From Inside The Circle presents... Live In Concert... featuring performances by Lennox, Krisirie, with a Songwriters' Circle featuring Indra, Mighty Gabby, Emile Straker... Saturday 11th August, 2018 at Mount Gay Distillery, Spring Garden Highway, Bridgetown. Start time 7pm, doors open at 6pm. Hosted by Phil Cartar. * This concert will be filmed as part of a new TV series * and will be followed by a small plates reception hosted by three Executive Chefs. Complimentary alcoholic and non-alcoholic cocktails by best Mount Gay mixologists. * All proceeds go to the Substance Abuse Foundation Inc.
or The Substance Abuse Foundation Inc.